Weekes Estate Agents believe in building communities and have come together with other local businesses to offer a fantastic selection of prizes to be won this autumn. Check out our Facebook or Twitter account each month for a chance to win a local treat. Last month Jo Nicholson was the lucky winner of a seasonal veg box from The Grocer On The Green. This October you can get your hands on a pair of Chiefs tickets to watch the Chiefs Vs Gloucester match on November 24th, courtesy of us friendly folk at Weekes. All you have to do is like our Facebook page (the actual page rather than just the post) and comment on the prize giveaway post. A winner will be randomly selected at the end of the month. 1. The competition is open to all UK residents, 18 years old or over, excluding households of employees of Weekes Estate Agents, their agents or anyone professionally associated with this promotion. 2. No purchase necessary to enter, internet access is required. 5. One entry per person per day. If it becomes apparent that a participant is using a computer to circumvent this condition by, for example, the use of ‘script’, ‘brute force’ or any other automated means, that person’s entries will be disqualified and any prize award will be void. 6. By participating in the promotion the entrant's licence and grant the promoter an exclusive, royalty-free, perpetual, worldwide, irrevocable and sub-licensable right to use, reproduce, modify, adapt, publish and display such content for any purpose in any media, without compensation, restriction on use, attribution or liability. Participants agree not to assert any moral rights in relation to such use where the moral rights in respect of the content are theirs to assert. Participants also warrant that any person featured has given their express permission. 7. 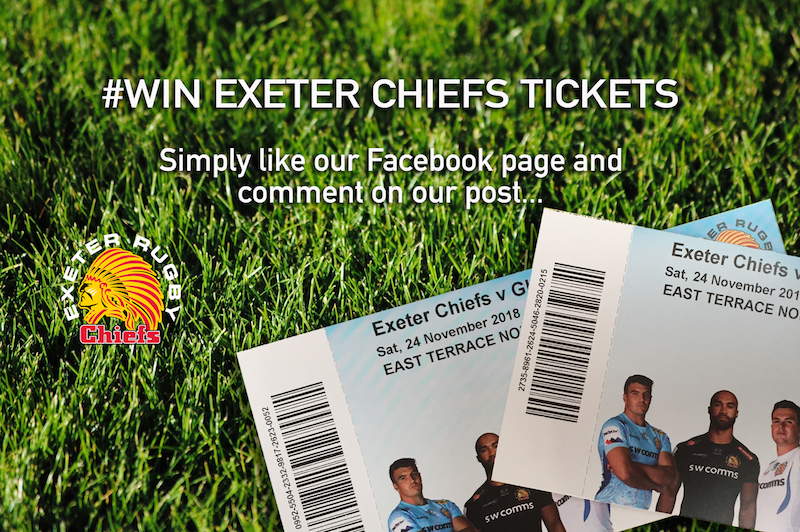 Prize: Pair of Exeter Chief’s Tickets (East Terrace North) for the the game on Saturday 24th November, Chiefs Vs Gloucester kick off at 13.00. This cannot be exchanged and the winner must be available to attend this game. No transportation is given and so the winner will need tomato own transport arrangements. 8. The winner will be chosen by a random computerised system from all entries correctly submitted on Facebook and Twitter in accordance with these terms and conditions. The winner will be announced on Thursday 1st November. 9. A password will be provided to the winner and they will need to use this password to claim the prize. Once the prize has been collected using the correct password, we cannot issue another voucher if someone other than the winner has collected it. 10. The prize will need to be collected from Weekes Estate Agents in Magdalen Road within 7 days of claiming the prize. 11. No responsibility can be accepted for any entries that cannot be made, are incomplete, corrupted, delayed or not received for any reason whatsoever. 12. Prizes are not transferable or exchangeable and cannot be redeemed for cash or any other form of compensation. In the event for any reason the prize winner does not take any element of the prize at the time stipulated by the Promoter, then that element of the prize will be forfeited by the winner and neither cash nor any other form of compensation will be supplied in lieu of that element of the prize, unless otherwise agreed. 13. The winner may be required to take part in publicity resulting from these prize draws. 14. This promotion is in no way sponsored, endorsed or administered by, or associated with, Facebook, Twitter or Instagram. 15. You are providing your information to Weekes Estate Agents and not to Facebook, Twitter or Instagram. 16. The Promoter’s decisions regarding all promotional matters will be final, and no correspondence will be entered into. By entering the promotion, all entrants will be deemed to have accepted and be bound by the rules and consent to the transfer of their personal data to the Data Controller for the purposes of the administration of this promotion and any other purposes to which the entrant has consented. All entry instructions form part of the rules.